Winchester .22 Caliber Short Black Powder Blanks -- 50 ct. $14.99. Today we're going to talk about .22 caliber blanks. I prefer a .22 pistol working with young dog especially. And the main reason I like a .22 is the difference in the blanks. .22s are more expensive from a blank standpoint than a .209 primer. But the difference here is that you get some different volumes. And I want that low volume for starting with a puppy. That's what we call acorn blanks or .22 crimps. It's a very small crimp blank; so small you can barely see it. and they're quiet. And it's a great blank to introduce a puppy to gunfire. There's several different ways we want to about introducing gunfire, but we want to start off as low as possible volume wise. There's just no value in going with a really loud sound. So, lots of different ways to do it. I prefer to do it after I've done a bird introduction. I want the dog to have that prey drive established. I want them interested in birds and thinking about birds, and then we're going to add gunfire on top of that. And we're going to do it at a distance. The further away, typically, the better. And then we're going to gradually move it in. We're going to start with the crimp blanks. After we've gotten to the point that a puppy is interested in this, we're tying gunfire to birds and we're going to start as low volume as possible. So once we've gotten to where we can release the bird and the dog is going after the bird and we're able to fire the shot within 10, 15 feet of the dog and he's fine with it and he's excited about it, then we're going to back up again and we're going to move up to the next blank, which is the .22 short. This is a CCI blank. Very similar, but it's a little bit bigger. Little more powder. Has a little more volume to it. I typically use these the majority of the time. It's a louder blank but not the loudest that we sell. And so, this is my go-to blank generally because I don't like the really loud blanks, which are the Winchester short blanks. This is a black powder blank. It is substantially louder. Much closer to the volume of a shotgun. I don't like them for myself just from the standpoint that they are just so loud. But it's a good way to condition a dog to that particular sound. Same thing here. Once you have worked through your .22s and you have gotten to where you can fire it close to the dog, and he's comfortable with it, and he understands the association between gunfire and birds, and when he hears gunfire he is thinking about birds, we're going to move back, once again, 100 feet away and we're going to start over with the .22 shorts. And we're going to gradually move that in until he is comfortable with it. At this point, you should have a dog that is very comfortable with the sound and he has associated it with birds and he likes guns. It's the safest way to go. And it's something that's a gradual, slow process. You don't want to rush it. you cannot go to slow doing this. It's the thing that people screw up the most. If you do not introduce your gunfire correctly and tie it in with birds, you can end up with a dog that may be afraid of gunfire. I will hear from folks that will go, "Well I fired off a shot and my dog was fine." Well, that's great. But you took a pretty big chance doing it that way. I know guys that will take dogs out to gun ranges and let them sit there and listen to people firing off hundreds of rounds. Same thing there. I hope it works out. But you are taking a really big chance. You've got a dog that you've established as part of your family, and if you screw up the gun introduction you are going to have a gun-shy dog that cannot hunt. And if he's part of the family you can't get rid of him now. So it's one of those things that taking your time and going it right is really important. And using .22 blanks is a great way to do it. "Shipment came on time and fast. Product was as listed. I will be ordering more soon." Shipment came on time and fast. Product was as listed. I will be ordering more soon. This product is excellent. The purpose of this product is to product is to produce the sound of a shot fired, and I think the sound is closer to that of a .38 caliber round. Excellent product. "Black powder is the loudest blanks I can find." Black powder is the loudest blanks I can find. "Excellent price. Work very well and will keep using them." I used Winchester .22 black powder blanks for all my track meets. Excellent price. Work very well and will keep using them. "Should be 100 to a box, and they work well and fire 100% of the time." Should be 100 to a box, and they work well and fire 100% of the time. Better than the ones in a round box. They are low quality and fire at 50%. "Cool round for training ,"
About every 5th or 6th shot one will fizzle. I use them in a haunted hay ride. I'm dressed western as a ghost rider and I shoot people in a fake western town. Maybe there is a better product out there. I like the black powder, smoke, flame, and sparks. 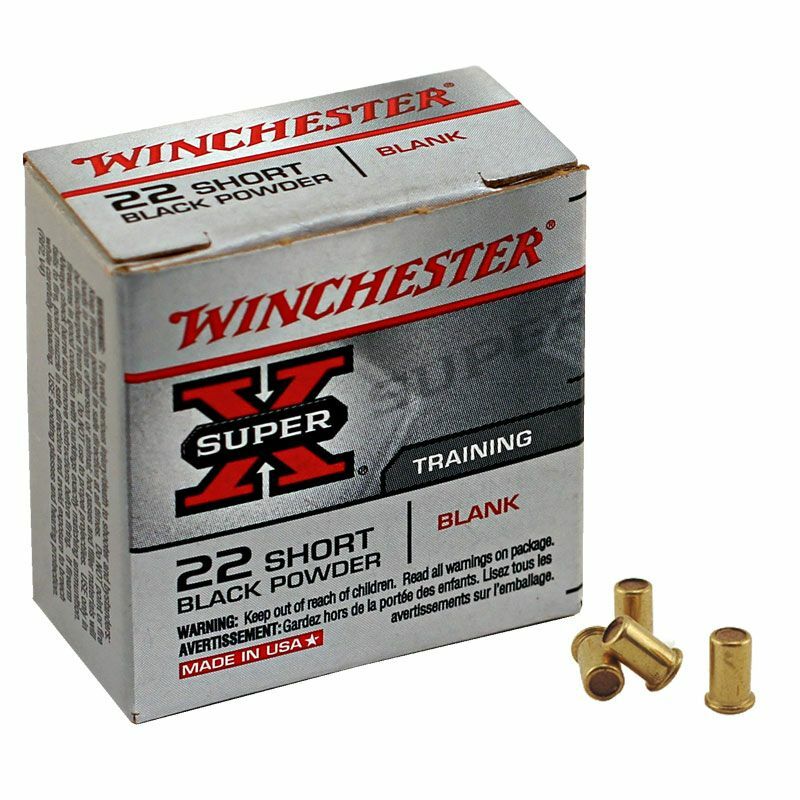 The Winchester "Short" .22's are the loudest .22 blanks that we sell. Made in the USA. 50 per box. Use and/or possession of Blank Pistols (Starter Pistols) and Blanks is prohibited and/or restricted in some jurisdictions. Laws change frequently. Therefore, all buyers should check with local authorities prior to ordering starter pistols and/or blanks.